I know y’all were probably expecting a finished vanity today. I’m so sorry to disappoint! I promise, there is a method to my madness right now, and my method required that I spend some time working on my DIY butcher block countertop for the vanity. This is one of those “one thing leads to another” and “one project is dependent upon another” types of things. Before I can really start putting this room together, I need to install the wainscoting. 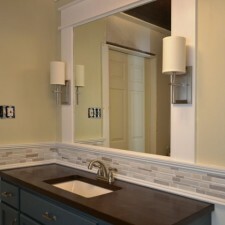 But because of the way part of it will wrap around and act as a backsplash for the vanity, the wainscoting has to be installed before I can install the vanity. But before I can install the wainscoting, I needed to know the exact height of the vanity with the countertop. Anyway, I’m off to a good start on the countertop but it’s far from finished. I got it put together, did a preliminary sanding with 60-grit sandpaper, cut out the sink hole, got all of the cracks filled with wood filler, and then sanded it down to a smooth finish with 150-grit sandpaper. It still needs staining, lacquering, and sanding (I want a hand-rubbed finish), but it’ll get there. (And I’ll explain why I chose lacquer when I get to that point in the process.) But so far, this is what it looks like. 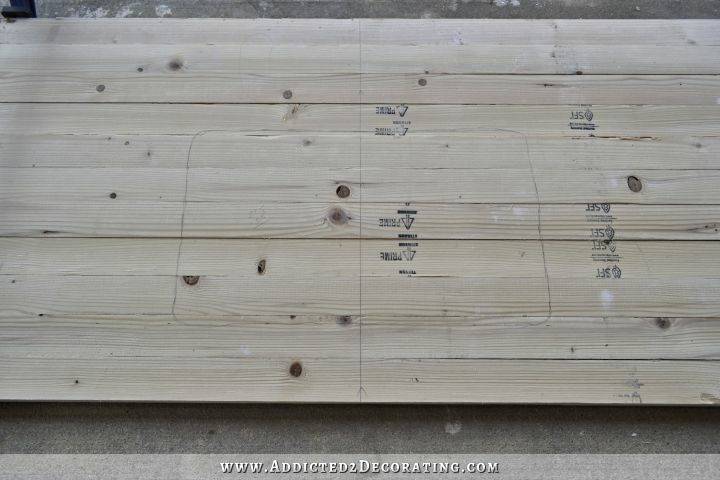 I shared this first part a few days ago, but just to review, I started out with 2″ x 3″ pine boards. I found these on the aisle in Home Depot where they have the 2 x 4’s and other 2-inch lumber, and they were just under $2 each. They are pine, and they started out pretty rough. They actually had a stamp on them that said “stud.” I’m not sure why 2 x 3’s would ever be used as studs, but the point is that they’re obviously intended to be used for structural purposes where they’ll be hidden, rather than used on an item that is supposed to be decorative. So I really had to dig through them to find ones that look relatively decent and aren’t warped. If I made a countertop out of those with the rounded edges, I’d be sanding for days (or using an obscene amount of wood filler) in order to get a flat surface. So I used my table saw to rip the boards on each side, cutting off about 1/4-inch from each side to remove the rounded edges. With the edges square instead of rounded, the boards could sit right up against each other and form a flat surface. To start putting the countertop together, I first arranged my boards, right side up, just like I’d want them to appear on the countertop. I looked at each board individually to determine which side looked better, and then arranged them so that I didn’t have several knots grouped together or anything like that. 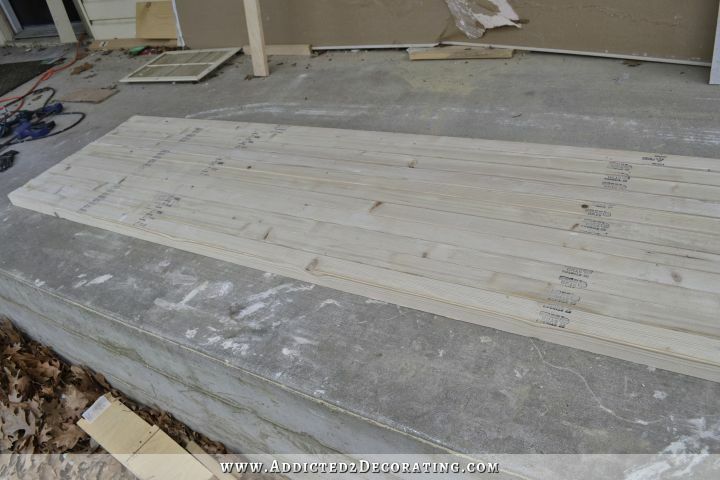 Then I flipped the boards over because I would be working on the bottom side of the countertop to put it together. I made sure to keep the boards in the exact same order and configuration as I flipped them and arranged them so that they were upside down. Next, I took some measurements on the vanity, marked where the center of the countertop would be, and then determined the position of the sink. I used the template that came with my sink to draw where the sink would go. My marks at this point didn’t have to be precise, as this sink outline wouldn’t actually be the cut line I use to cut the sink hole. I just needed an idea of where to the sink would be so that I didn’t put screws in or right up next to the sink hole. 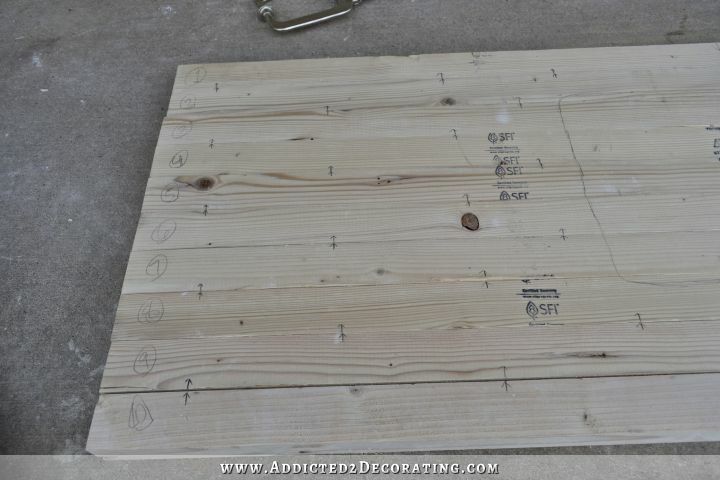 Then I numbered the boards and marked where I wanted my pocket pocket screws to be inserted. I staggered these marks, as you can see below. And then I used my Kreg pocket hole jig (this is the updated version of the set I have*) to drill the pocket holes, and attach the boards to each other one by one. I’m not going to go over the details of how to use a Kreg Jig since there are approximately 12,000 tutorials out there. 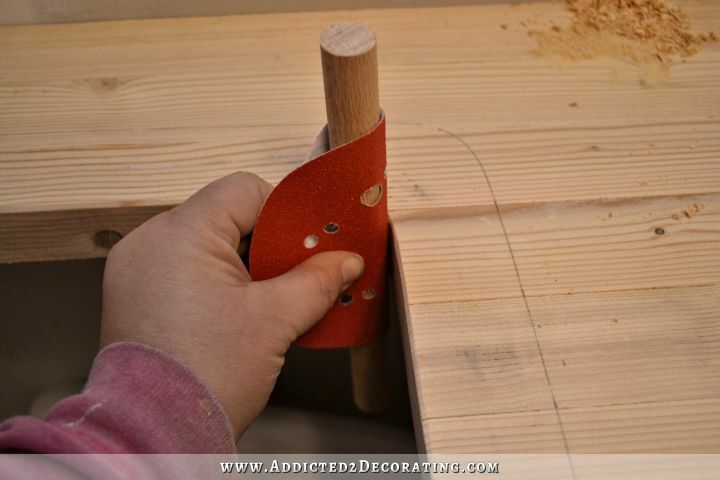 But I will say that it’s an incredibly easy tool to use, and every DIYer should have one! 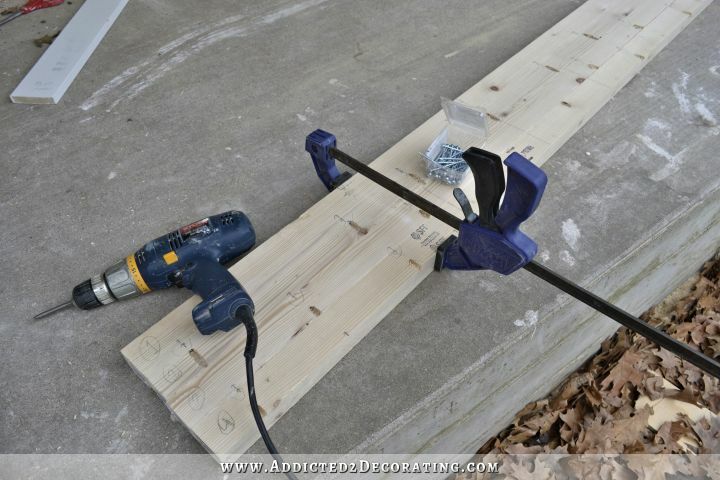 There are some really helpful videos showing how to use a Kreg Jig. 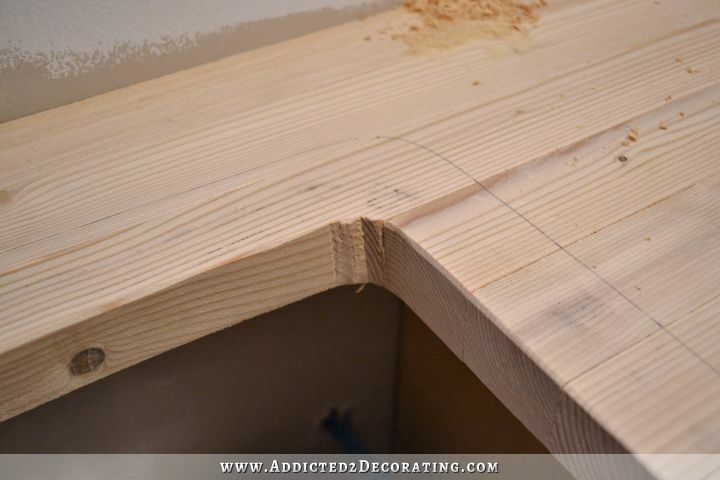 Ana White has a great video here, and then here’s another short video that shows how to join wood edge to edge like you’d need to do for this particular project. But again, you can just google “how to use a Kreg jig” and you’ll find a tutorial on just about every DIY blog out there. And as I was attaching the boards, I used my 24-inch clamp to keep them together while screwing them together. So the process was (1) drill the pocket holes in the next board using the marks I made as a guide for pocket hole placement, (2) add a bead of wood glue down the edge of the board, (3) line it up edge to edge with the previous board and clamp the boards together, and (4) attach the screws through the pocket holes. I would move the clamp down the boards as I worked my way down to the other side. 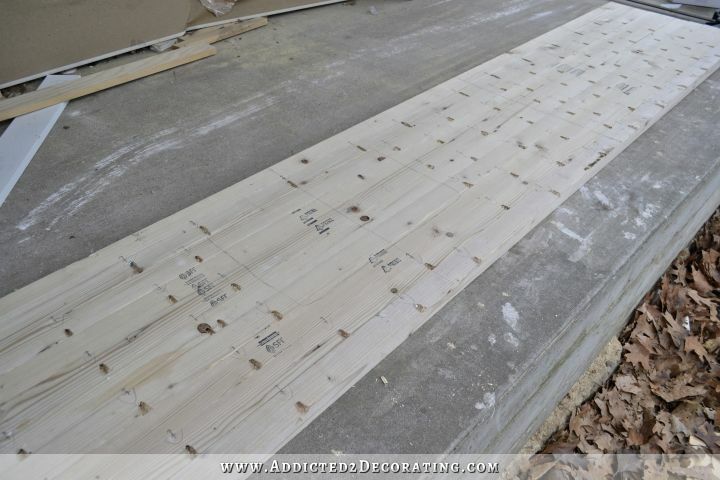 And each time I clamped the boards, before I added the screws, I would stick my hand under the boards and feel to be sure that the boards were lining up flush with each other on the top side of the countertop. It didn’t need to be perfect since I would be doing lots of sanding, but I didn’t want to end up with any really significant height differences from board to board because that would just require even more sanding. I know. Not very pretty. BUT…look at the top!! Ha! Okay, that’s not very pretty either. 😀 Not yet, at least. 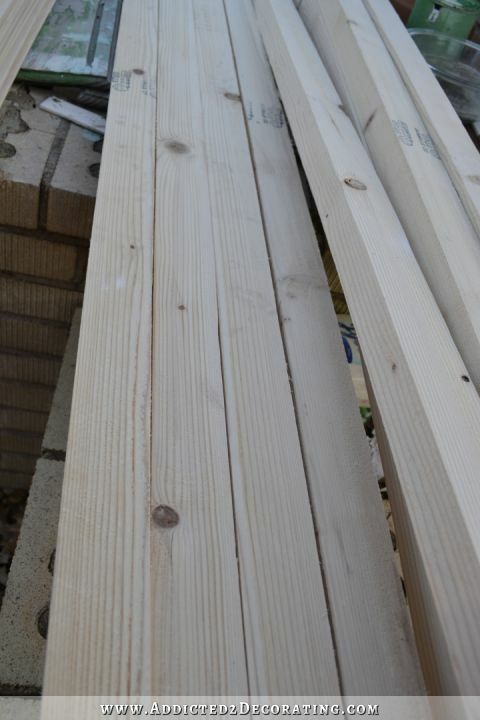 The boards were slightly unlevel with each other, and I had wood glue seeping out in areas. And of course, the boards had those ugly stamps on them. But not to worry, because all of that will be taken care of during the finishing process. But first, I used my circular saw to cut the countertop for the vanity to the exact length that I needed. The remaining 3 feet will be cut down to size later and used as a countertop in the linen storage area. So at this point, this is how the countertop looked. It was quite rough, but with lots of potential. At this point, it really would have been nice to have a planer. That would have made quick work of smoothing out and leveling out the top perfectly. 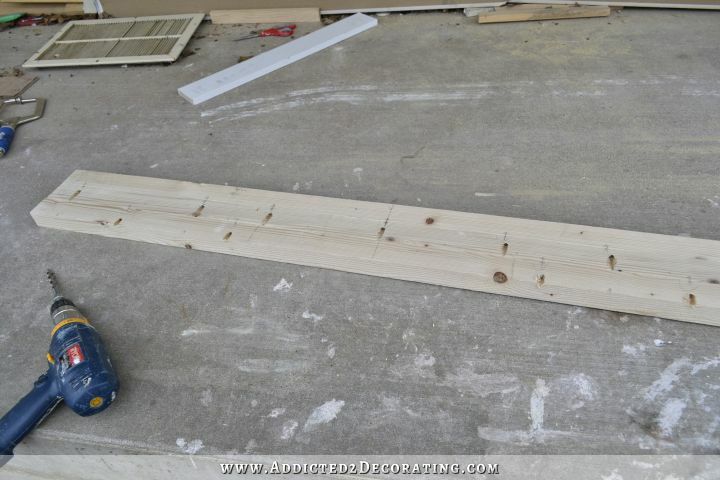 But most of us DIYers don’t have fancy planers (especially not the size needed for this type of project), so I I had to rely on my sander to do the job instead. I spent about 20 minutes giving it a preliminary sanding with 60-grit sandpaper, and it was already starting to look and feel much better. That 60-grit sandpaper cut right through all of the rough areas and wood glue, and leveled out the boards quite nicely. It also quickly removed the lettering that had been stamped onto the boards. Before I did any more sanding, I cut out the hole for the sink. 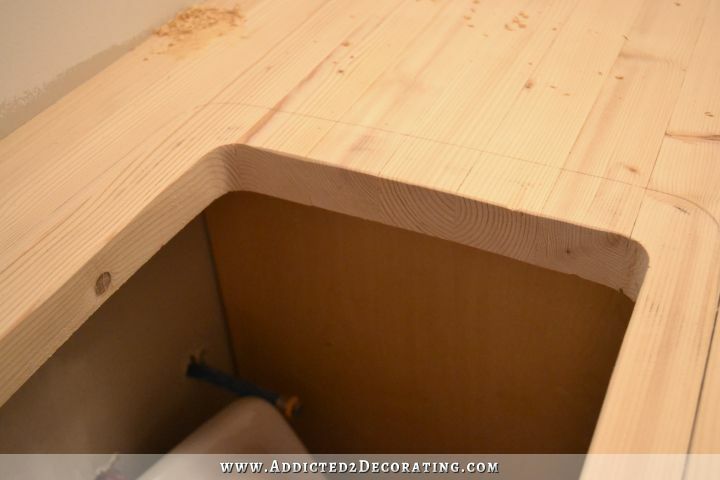 Since I’m using an undermount sink, and the edges need to look nice and finished, this part made me very nervous. I could just see myself ruining all of the hard work that I had put into this countertop so far. Unfortunately, because of the thickness of the countertop, I wasn’t able to use my fine blade that’s made for cutting curves because it’s not long enough to cut through wood this thick. So I had to use a much larger blade that would not go around corners no matter what I tried. So I was left with corners that needed quite a bit of sanding and finishing in order to make them look nice. In order to clean up those corners around the sink cutout, I grabbed a scrap piece of dowel rod (probably 3/4 inch dowel) and wrapped some 60-grit sandpaper around it. Then I used that to sand off the excess from the corners. It worked out great! That 60-grit sandpaper really made quick work of rounding out the corners and removing the excess wood. Then I was finally ready for wood filler. I’ve said it many times before, but I’m very generous with my wood filler usage. I made sure to push it down into all of the cracks as much as I could, and I also used it to smooth out all of the knots. It took a couple of hours for it to dry, and then I used 150-grit sandpaper on my sander to smooth everything out. At that point, it was really starting to look nice! I also sanded all of the edges by hand to give them that slightly rounded look that I like. I think it’s looking great so far! 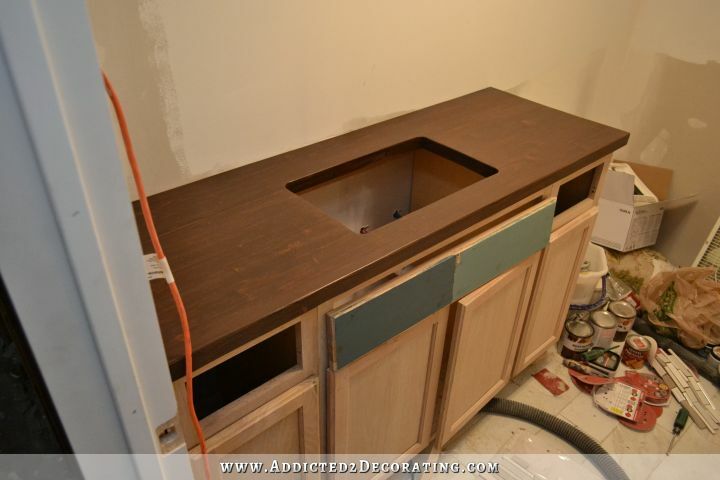 Click here for details on the finished countertop. I thought I had decided on lacquer, but a few people have warned me against it. So now I’m undecided. I’ll definitely use an oil-based product. I’d never use a water-based product around a faucet. You give so much hope to those of us on a budget! We can have beautiful and functional homes on a budget! Thanks again. Wow! I had a butcherblock countertop fabricated by a professional woodworker last year, when Ikea had no supply for months. It didn’t look any better than yours, and I would hate to tell you what it cost! Beautiful work! You should still just let us know, then we can see how ridiculous they raise their prices..
First of all, great job on the counter top, this is a great low budget solution. I did want to point a few differences between what was done here and what you typically get with a traditional butcher block. This counter-top is made from construction lumber, or pine, which is considered soft wood. 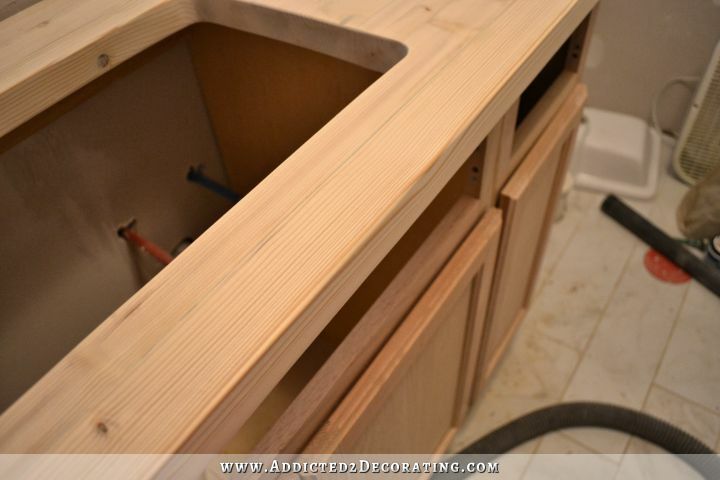 This counter top will be very susceptible to damage from everyday use (i.e. dents, writing marks, etc.). 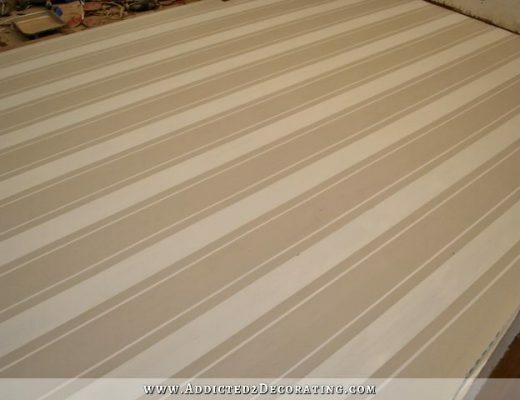 Depending upon the finish applied these dents can then lead to further deterioration of the surface and failure of the finish in and around these blemishes. Butcher block is typically made from hard woods such as maple or cherry. These woods are harder, as suggested by the classification, and will hold up better under more demanding uses (i.e. cutting, dropping a hairbrush onto it, general work surface activities). I don’t mean to advocate for one over the other, just that it is important to understand what you want from your surface. 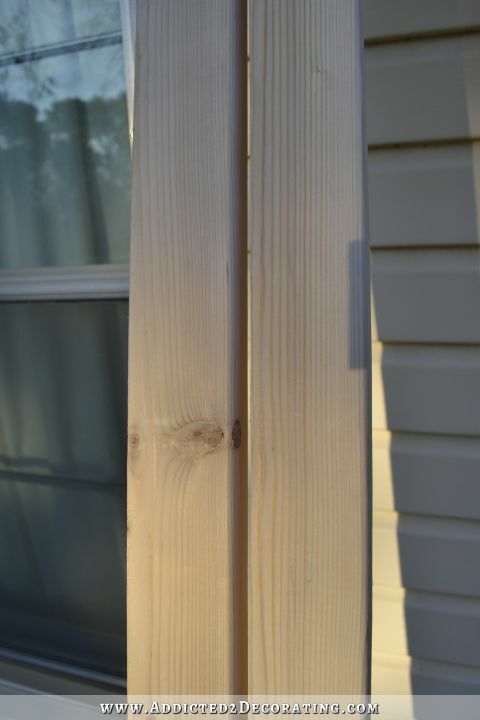 A blemished surface that shows signs of use may be just what people are looking for, if not, they won’t get the results they are hoping for from simple pine construction lumber. Basic takeaway, butcher block cost more because the materials, and subsequently the performance, are superior. Looks great so far. Seems this would have been the perfect excuse to buy a router! Kristi this is amazing. I don’t know anything about carpentry but I can appreciate all the work you put into what you’re doing. Goodness your home will feel like your baby by the time you are finished! I am in awe, as always, of your work. That looks frickin’ amazing!!! Love love love it! Wow I love this! 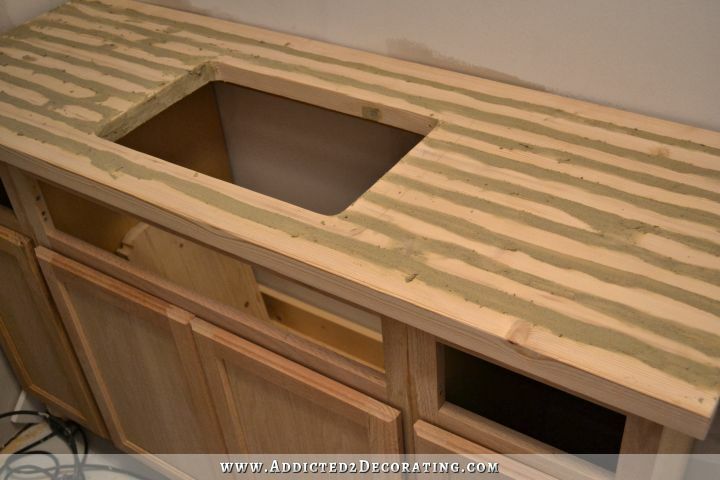 What a great economical way to create a countertop. It’ll be interesting to see how it takes to stain. Should be awesome! Can’t wait for your next post…Love the progress you are making and the ideas you are presenting…Wish I lived closer…I would come sand for you..or maybe bring you and Matt lunch…How is the sale of the condo coming along? Did you consider the rental idea? I haven’t done anything over there since December. 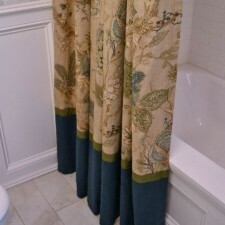 It’ll be my top priority after this bathroom is finished. So I am always cheering you on and waiting for your posts….. Sorry to hear that turning 70 is slowing you down. We are the same age. I recently tore out the ceiling in my kitchen, refaced the I-Beams to look like more substantial beams and built three base cabinets. Right now I am building the frame for my bell shaped vent hood. 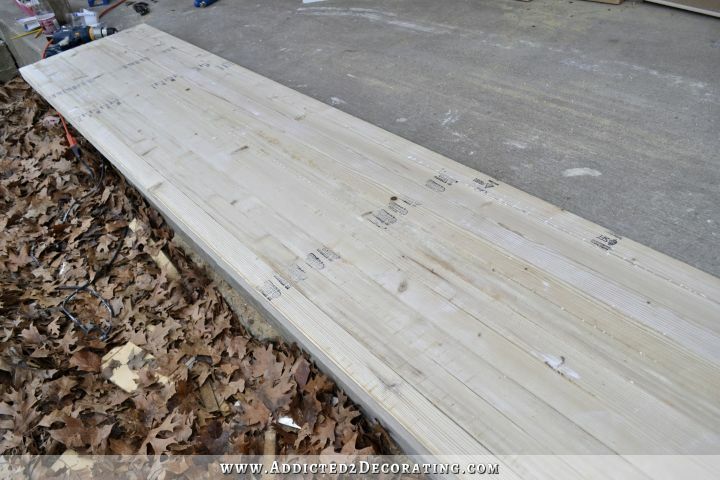 When that is finished, I will be installing shiplap on my walls. I do leave electrical and plumbing to the pros but everything else is MINE! My grandfather built a house when he was 70 and my dad reroofed HIS house when he was 75 (probably not the best idea). Don’t plan to slow down until I absolutely must! Will you add a backsplash at all? If so, what are you thinking about? I’ll be using a mosaic tile. I found this site by accident – a happy accident. Now it’s the first thing I check everyday. I can’t’ wait to see the next chapter in your DIY adventures! I, too, am a DIY’er and I love that you show how a DIY project really goes. One thing leads to another and, for me, it ALWAYS takes longer than I had thought it would. And it doesn’t always turn out how I thought it would. Thanks for keeping it real and sharing the process. What a mountain of work, and what rewards you will reap! 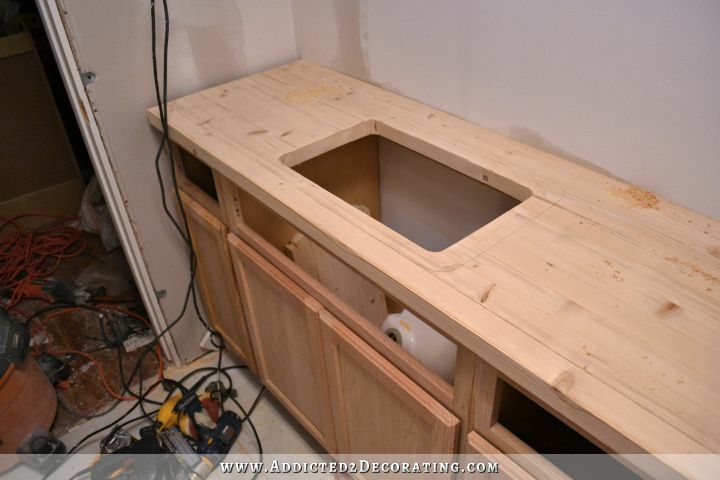 I’ve never seen an undermount sink used in a bathroom, so I am excited to see the finish product. I do hope you can make the edges of the wood waterproof above the sink. I guess I’m not as badly OCD as I thought, as I would have just stopped with a drop-in sink, instead of going for the gold. That’s exactly what I was going to say. Kristi rocks! WOW!!!!!!!!!!!!! I am almost speechless. That looks simply gorgeous. I bow to you, Oh Queen of DYI. Another custom-made, awesome project by the master DIY’er! It’s turning out great, can’t wait to see the bath completed, but love seeing every step along the way even more. A great product for finishing butcher block counter tops is Waterlox tung oil. It is a great product for use in areas that need protection from water. Also, I am curious to know if you had to move the cabinet a half in or so away from the wall where the door is located in order for the left most cabinet door to open completely. 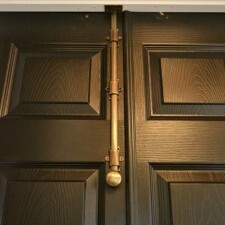 We had a situation where our cabinet installer nearly justified a cabinet to the left when we had plenty of room, only to quickly discover that the door would not open to 90 degrees & the drawer above would not open due to hitting the door trim. 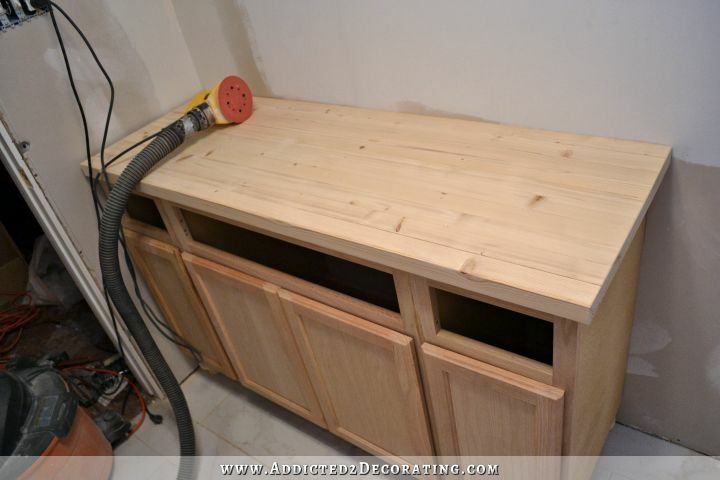 Of course, he had to use some filler trim to cover the gap between the cabinet & wall but it was better than having to sand down the door trim in order to open the drawer! 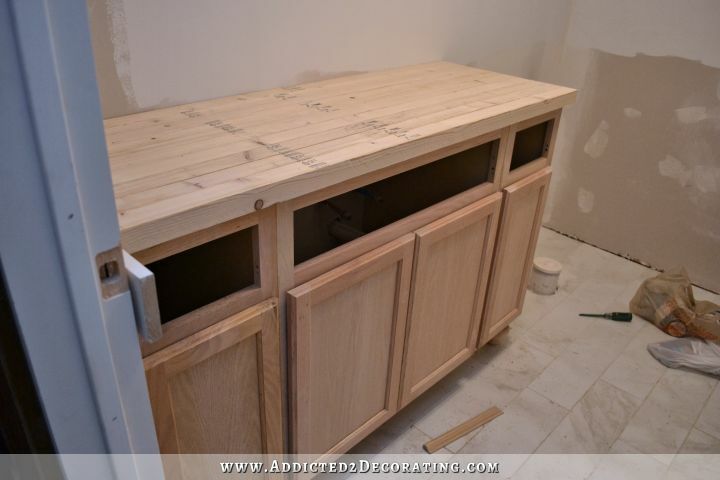 As I understood what Kristi wrote, she is now taking the whole vanity & counter out, now that she knows the height after building the vanity & butcher block for that reason (to establish height), to put in wainscoting that will also act as backsplash. 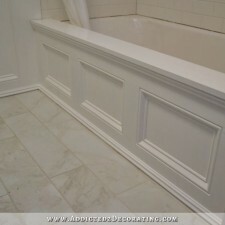 I can also see in some photos she’s put in a loose baseboard spacer, not that it was probably needed at this point, but if I know her, she has the depth of the baseboard and wainscoting on the left side of the vanity in mind, for exactly the purpose of allowing drawer and door clearance. 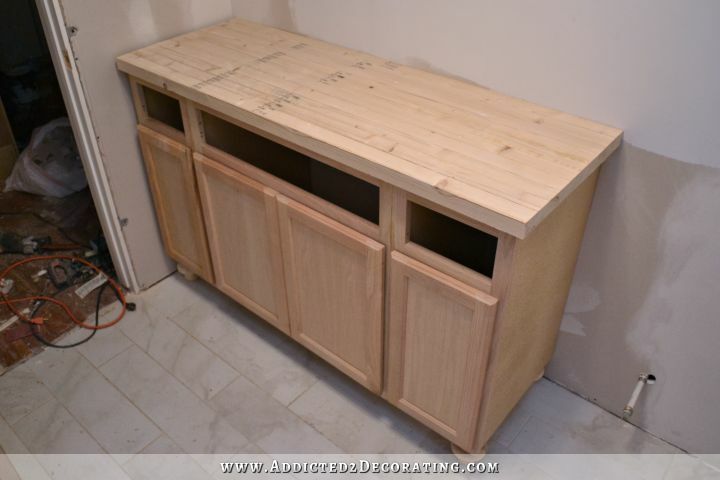 Plus the raw cabinets didn’t have the drawers and doors flush to the edge. Lastly, all of this, plus (not to speak for her), because she’s made this as a “furniture piece” vanity, it can be floated in the room and there’s no need for it to be completely flush to the wall, because it’s not a “fitted” piece. We did this in our guest bathroom with cheap lumber. The stain took beautifully and the pieces looks amazing. We get compliments on it all the time. 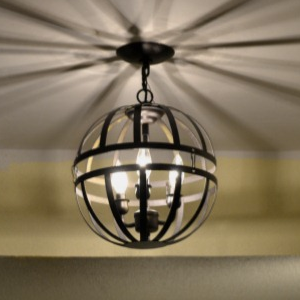 Your DIY skills are much better than ours so I know it will turn out to be a stunner! Are you getting water damage to your countertops? That is looking beautiful! You did a wonderful job on those corners, I am impressed! 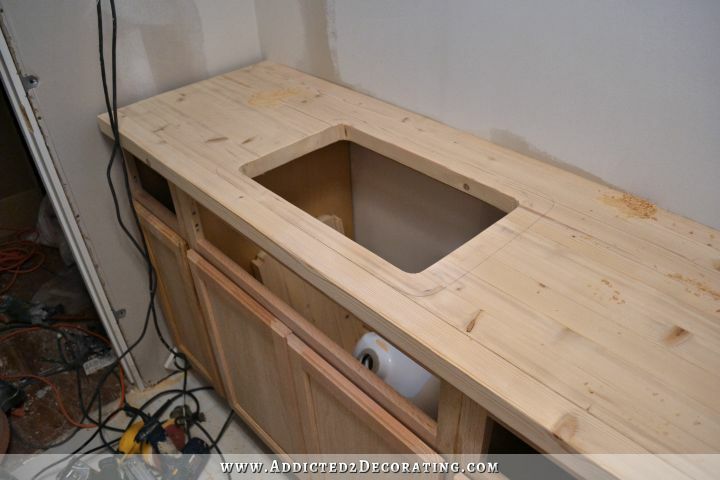 I have seen other people do similar sink cut outs and they used a large drill bit, or a small hole boring bit for the corners, which might make them easier (a little less hand work, maybe). 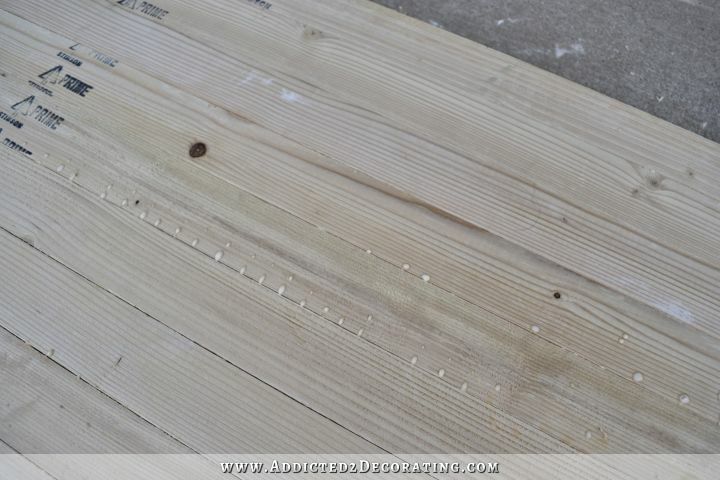 They drilled the corners, and used the resulting hole to start the jigsaw. I love when your posts show up in my email, you always impress and inspire me! Can you show a close up view of how you attached what I assume is a shop vac to your sander? I can’t seem to match mine up correctly – I know I need some sort of adapter but I’m not sure exactly what. I don’t have a special adapter. I have to hold the shop vac hose onto the sander a I use it. It doesn’t stay attached on its own. Can’t wait to see this stained! Looks wonderful, Kristi! I love watching this all come together. As a side note, 2x3s aren’t used as “structural” meaning load bearing. They are, however, acceptable for building a non-load bearing wall which is why they are still labeled as “stud.” They are great for building walls in a basement since space is a premium and the load is already carried on the foundation walls and I-beams. Nicely done! Will you use some kind of wood conditioner to insure the stain will soak in evenly? I’m looking forward to seeing the finished vanity! If it looks ANYTHING like the others you have done….it will be fabulous!!!!! It looks great so far! 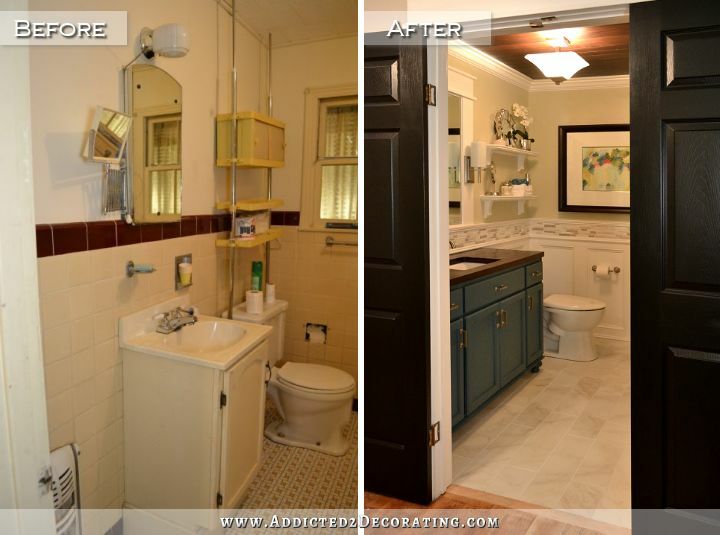 You are making wonderful progress and the whole bathroom should come together soon. Wow! It looks great! I love how you can buy something cheap and make it into something high end. Now you’re going to keep us in suspense!?!?!!?? Not sure I can stand this. Hopefully you’ll be showing us the results soon!!!! My parents made a red cedar counter top in their home in Sedona, AZ. It was beautiful and unusual. But they had hard water, and any water left to evaporate on the counter left a white mark. It wiped off, but it was an issue. This was 30 years ago, and finishes have improved since then, I’m sure. Your work is amazing. Reading your blog is a high point of my days. You go, Girl!! That was interesting to read on how you achieved you top. I’m sure it will stain up and become a Bathroom with the WOW factor. Thanks for sharing. Would you mind sharing the kind & brand of wood filler you use? 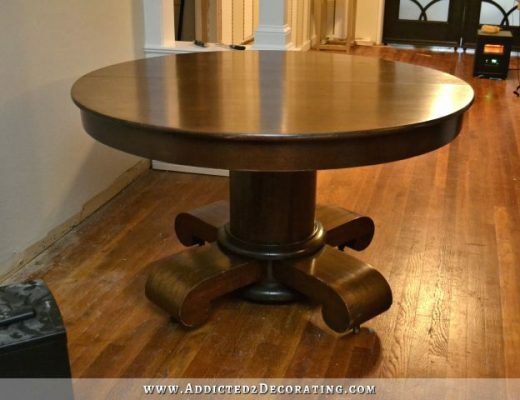 I paint & refinish furniture for a living and have had varied success. Thanks so much. You are my DIY hero! I use Elmer’s from Home Depot — the kind that comes in those little tub containers. Excellent idea. I plan on using it myself for some long counter tops in my study. FYI, the studs that you used are “furring studs” used for non structural walls, such as covering brick face. Keep up the great work, I look forward to your next posting. Great description, thank you. Will be attempting to follow your steps this weekend! So sorry for the late reply! I use Elmer’s wood filler from Home Depot. If you’re having problems with it taking the stain, then the problem is probably the stain that you’re using rather than the wood filler. 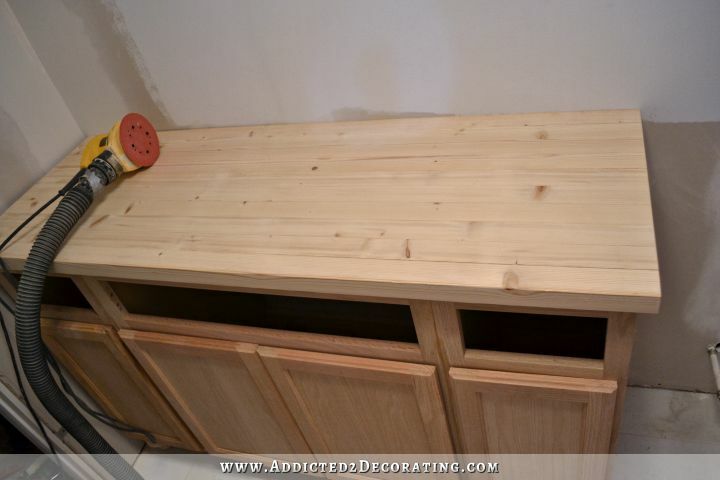 I used to use Minwax stain, and it NEVER soaked into the wood filler areas. Now I use Rust-Oleum wood stain exclusively. 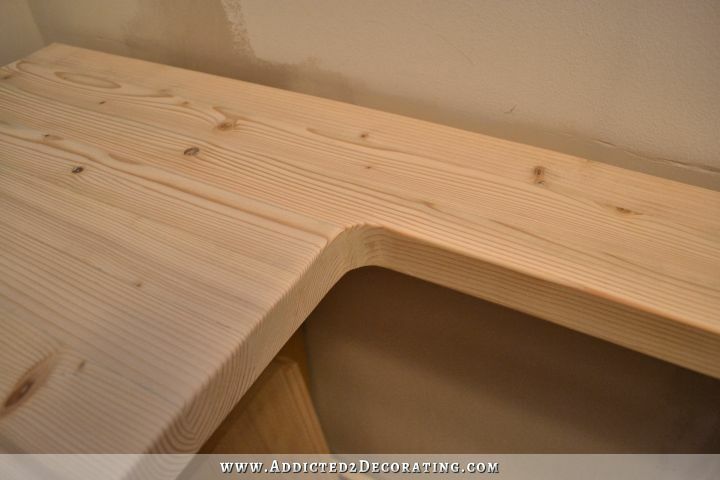 It’s far superior to Minwax in every way imaginable, including how it works and looks on wood filler. Do you have the part 2 for this article? Looks great, why not use wider pine 2x’s? Were you afraid they would bow or flex too much since they couldnt be fastened together as close? You can use whatever width you want. I was hoping mine would turn out looking like actual butcherblock (which it didn’t really since I stained it so dark) and butcherblock is generally made up of pieces that are narrower in width. Thanks for making these instructions. I wanted to make a butcher block table, and I was intrigued with your process of using pocket screws instead of bar clamps. This was really helpful! What did you use to seal the countertop? I’m having trouble deciding on a topcoat for my bathroom counter. 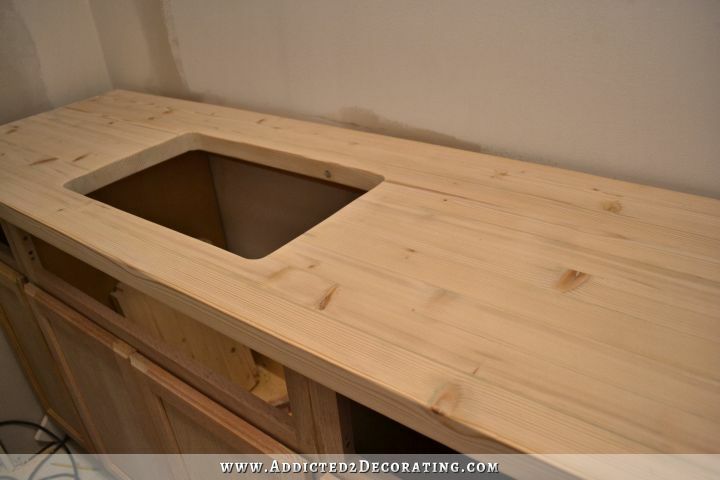 Please tell me what brand of wood filler you choose to use for this countertop. I am in the process of making on like you did and want to know your preference for wood fillers. Thanks, you are wonderful and so motivating, you have changed my life and I am forever grateful. 3 years later, how do these counter tops look now? 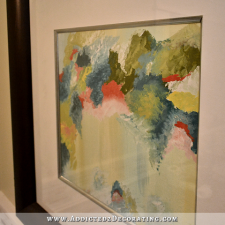 Do you have a tutorial for your finishing process? Were the materials food grade? I refinished the countertoep last month, not because the finish was damaged (it was actually in perfect condition), but because it was darker than I wanted it for the more colorful makeover I did last month. I wanted a slightly lighter finish. I did give instructions for the new finish. 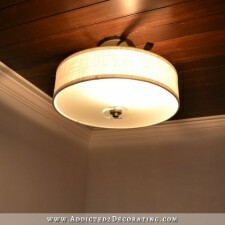 You can see it here: https://www.addicted2decorating.com/how-to-refinish-pine-wood-countertops.html. I used General Finishes High Performance Topcoat in a matte finish. I have no idea if it’s food safe, but I’m sure there’s info on their website. I’m curious if you had any issues with expansion and contraction due to changes in humidity. Boards screwed and glued lke that can split, especially soft woods like pine. By the way 2×3 studs are typically used in spaces where structural support isn’t required, like framing out a basement, and where space is limited.